Khodorkovsky challenges blocking of his website in Moscow court | Russian Legal Information Agency (RAPSI). 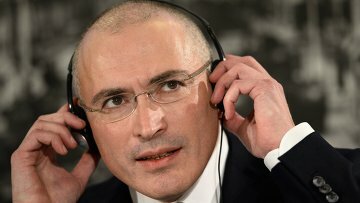 MOSCOW, February 11 (RAPSI) – Ex-Yukos owner Mikhail Khodorkovsky has filed an administrative lawsuit seeking to declare blocking of his website by Russia’s communications watchdog Roskomnadzor illegal, the spokesperson of Moscow’s Tagansky District Court Yulia Sukhinina has told RAPSI. The action has been already registered by the court. Allowance of the suit will be determined within three days, the court's representative has said. Roskomnadzor has restricted access to Khodorkovsky’s website mbk.news. The former Russian tycoon demands its unblocking.